With the release of iPhone XS/XS Max/XR, iPhone transfer and backup becomes necessary. In fact, creating an iPhone backup is not as complicated as iTunes or iCloud. There are various apps that will help you backup iPhone to Mac easily and fast. For iPhone users who want iOS 10 update or switch old iPhone X/8/7/6S/SE to latest iPhone XS, why bother with iTunes or iCloud? Here top 4 apps are shared to backup iPhone to Mac for a preparation of upgrading to iOS 12 or iPhone XS. MacX MediaTrans allows you to backup all your iPhone files including photos, music, videos, books, audio, ringtone, iTunes purchases etc to Mac computer. It's totally competent in case of losing data in the process of updating to iOS 11. 1. Extremley fast speed, e.g. 8s to transfer 100 photos from iPhone to Mac in 4k resolution. 2. Backup music/videos/photos, audio, iTunes purchases etc from iPhone iPad iPod to computer as a backup. 3. Manage data on Mac, add playlists, edit info, delete etc. 4. Import videos from Mac to iPhone, no matter MP4, M4V, or MKV, AVI, FLV etc. 5. Auto remove iTunes DRM to backup iPhone locked purchases on computer in limit-free MP4/MP3. 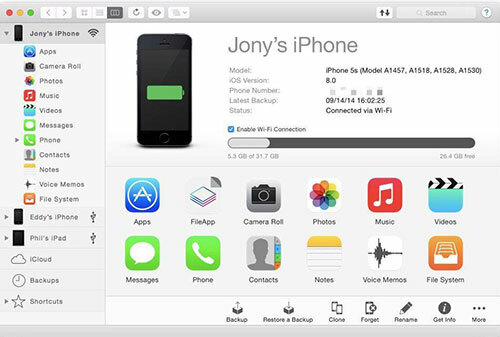 MacX iPhone Mounter is greatly effective to backup photos, music, videos and more from iPhone onto your Mac. It transfers all your media files fully and fast without any data loss. Meanwhile, it is designed not only for iPhone, but also compatible with all generations of iPhone, iPod, iPad. Easily Transfer iPad/iPhone video, movies, music, eBooks, photos, podcast to Mac. Mount iPhone, iPod, iPad as Portable devices to export files on Mac. Read and export pictures and videos recorded by iPhone to share with just a flick. Quick view mode and search function. The option to play and preview videos, music and other files in iPhone, iPod, iPad less than 10MB. 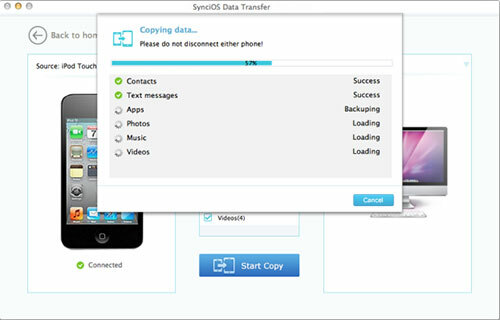 Likewise, Syncios also works as an iCloud/iTunes alternative for Mac to backup iPhone to Mac. Any you may also be surprised with the convenience this iPhone backup software brings. This is a very safe and quick tool to get photos off iPhone to computer, copy iOS music songs, even purchased music, TV shows, apps and video from the camera. One of the best things is that you can back up your device settings, as Favorites, Wallpapers, Mail, Contacts, Calendar accounts. All of your app data it will be surely backed up. Better still, it's compatible with the macOS Sierra, El Capitan and Windows 10. By the way, in order to use SynciOS you must have already installed iTunes, even you do not have to run iTunes. Want to backup or transfer to iphone 6 (Plus) since many users report data loss after iOS upgrade? This article will tell you how to backup iPhone and transfer data with iTunes and iCloud. 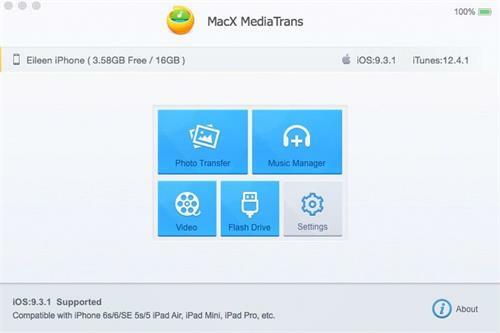 MacX MediaTrans is a full-featured iPhone backup software for Mac to backup iPhone, iPad, iPod movies, videos, music, phones etc. to Mac with super fast speed in one click.